If you are a sucker for surprises, you are going to absolutely adore the house we're exploring today. Ready? First off, the area where the house is built is 3000 metres above sea level, which also means that temperatures can drop really low, a factor that had to be taken into serious consideration while designing this house. The brainchild of Mexican firm GOO Architects, this amazing house has been designed in such a way that its north face is strategically covered in order to protect it from harsh winds and the cold while the south face is kept open with great views of the garden and ample sunlight. 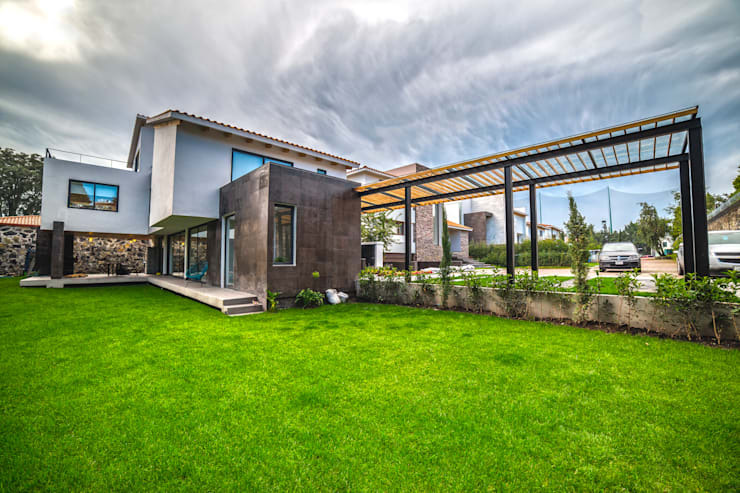 The family home is built over a space of 315 square meters, in the midst of an expansive lawn. The style is decidedly minimal but keeping in mind that contemporary design is in itself quite fluid, elements from other styles are freely borrowed and incorporated. Let's dive in! Before we look at the facade in detail, let's get straight to the gorgeous interiors. 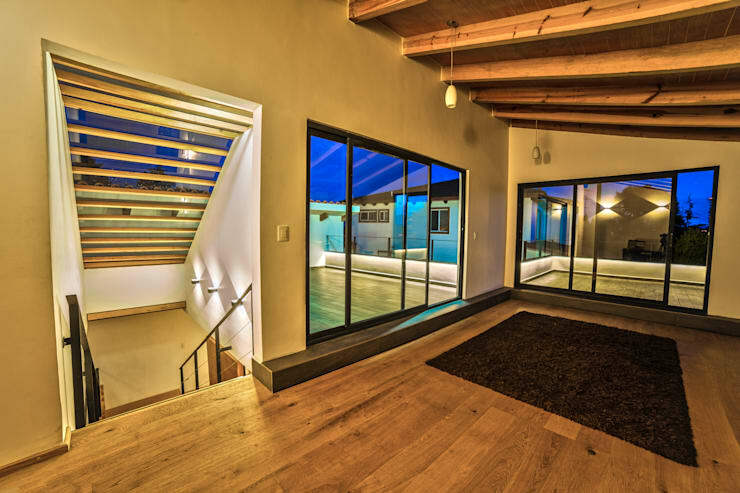 On the ground floor of this two-storeyed house you will find the living room, dining room as well as the kitchen. They all share a large common space with no divisions whatsoever making this an open and dynamic area. Notice how it feels as if light is being reflected off of nearly every surface here, a trick achieved by sticking to light colours.The overall palette is kept neutral—whites and greys are the predominant shades—but colour makes its appearance through accents such as the bright orange carpet, cushions and the paintings on the wall, infusing the space with quirkiness. Isn't it amazing the things you can do with a small bathroom, if you just wrack your brains a little? Look at the bright side—you can achieve a lot by doing a lot less. 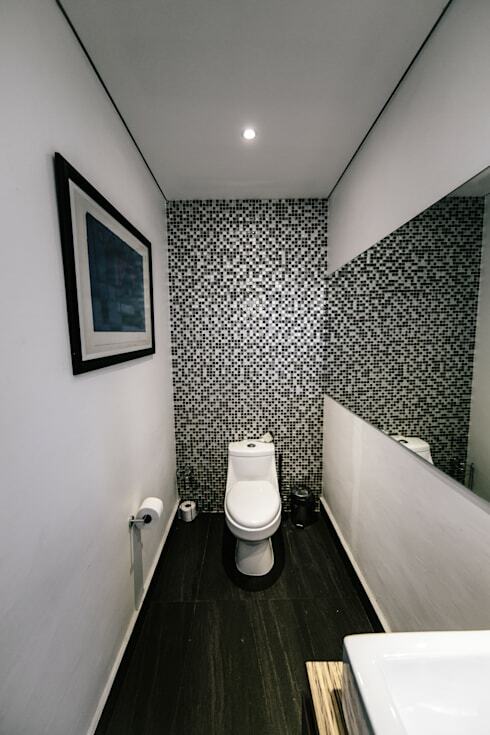 It is always a good idea to have large glass mirrors in a small bathroom (or in any small space really!) as it will visually open up the space a lot more. Speaking of visual elements, the ceramic tiled focus wall seen here (juxtaposed with the plain white walls) immediately creates a dramatic effect in the otherwise simple bathroom. You may think that there's only so much you can do with stairways and balustrades, but you are about to be proved very wrong. The stairway here does not only have a functional purpose. It is pretty much the focal point of the ground floor. 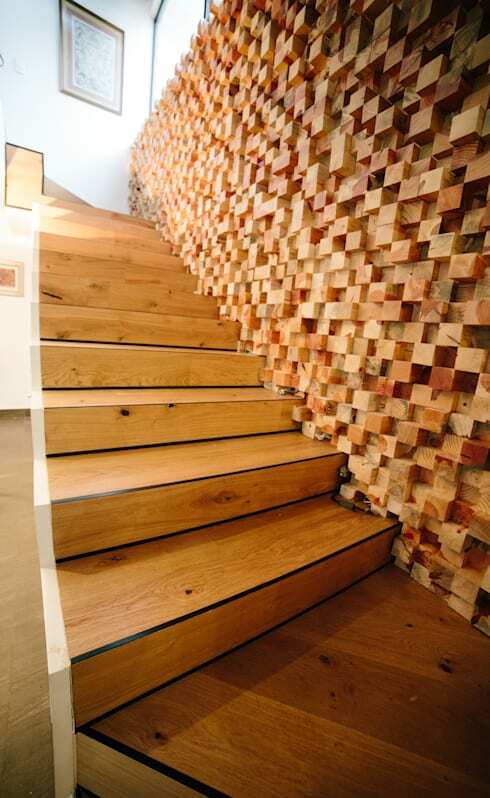 While the stairs itself are made of wood, the wall adjacent to it is made with recycled wood; wooden blocks with different patterns have been arranged in alternating depths creating an interesting visual element. But beyond the decorative factor, the wall also serves an acoustic purpose, it acts as a sound barrier by absorbing background noise! On the second floor of the house, you will find the more private spaces—the master and guest bedrooms and the TV room. Undoubtedly, the highlights of the second level are the spacious terraces and the way they become included in the design of the interiors. There's also a third level here that's hidden by the sloping roof and that doubles up as a playroom and a guest bedroom. Speak to our experts if you'd like to find out more about replicating this in your own home. We leave you with this striking picture of the south facade of the house. A spacious and welcoming garden adds colour and character to the imposing, sombre-hued facade. We also adore the pergola that separates the garden from the parking area. An interesting feature of this house is the way the architects have played with volumes and geometries, creating an asymmetrical end product that is visually arresting. To see another multi-volume house, check out The box home full of surprises. 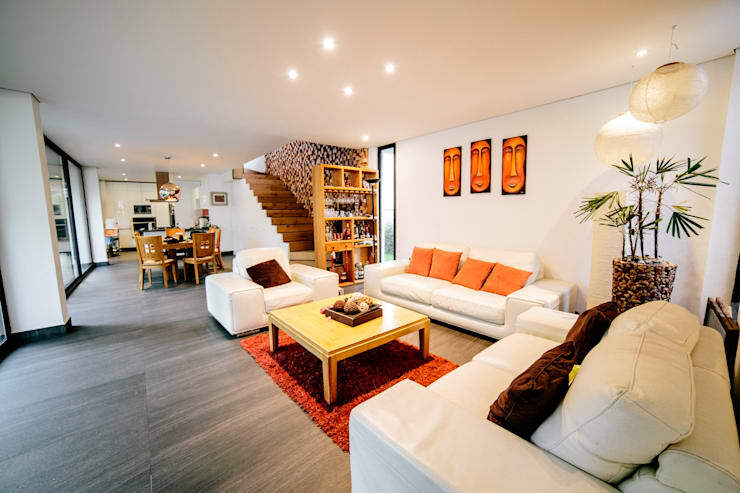 What did you think of this contemporary two-storey home?